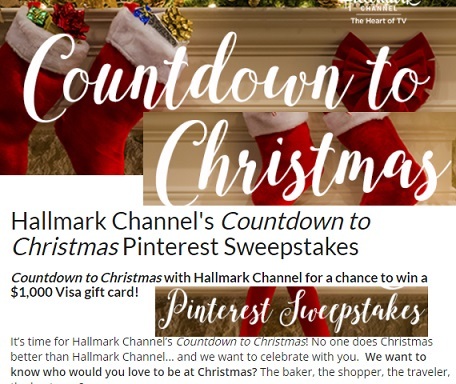 Enter the Hallmark Channel’s Countdown to Christmas Pintrest Sweepstakes or your chance to win $1,000 Visa Gift Card! 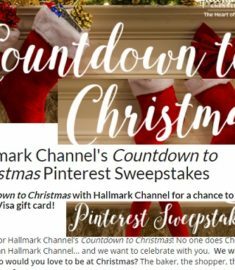 It’s time for Hallmark Channel’s Countdown to Christmas! No one does Christmas better than the Hallmark Channel... and they want to celebrate with you. Hallmark want to know who would you love to be at Christmas? The baker, the shopper, the traveler, the host or …? To enter the Christmas Sweepstakes, simply Pin one of the images below along with #CountdowntoChristmas and #HallmarkChannel that best describes the part you play at Christmas. Then enter your board (or pin of your choice) for a chance to win a $1,000 Visa gift card! The Hallmark Channel is the best place to head this time o year, snuggle in every weekend night as we premiere a record-breaking 21 new Countdown to Christmas movies now until the end of the year! I love Christmas movies! Its my most favorite time of the year, the sweepstakes and giveaways are huge at this time of year! If you haven’t started entering giveaway and sweepstakes yet, this is the perfect time of year start and a great chance to win some sweet stuff! Last year I won a cash giveaway and and toy bundle for my kids, I call that a win win!